new and expanded plants for building materials rise from the ground. Stonecraft Industries built a 300,000- sq.- ft. (27,870- sq.- m.) factory and warehouse in Wooster, Ohio. The $24- million project creates 300 jobs for Wayne County and is one of 42 new building materials plants in Ohio in the past year. The Buckeye State led the U.S. in new and expanded building products facilities in 2006.
eveloping a region into a magnet for corporate facilities is a lot like laying the foundation for a large factory. Without the right building blocks in place, you'll never see the end result. 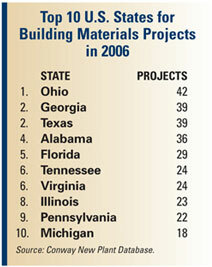 As Ohio celebrates its victory in the 2006 Site Selection Governor's Cup, it's worth noting that the win might not have occurred without the Buckeye State's comparable dominance in the building materials sector. In 2006, Ohio recorded 42 new and expanded plants that manufacture building materials – everything from steel, copper, zinc and brass to cement, lumber, PVC pipe and decorative stone. Ohio placed first in this category, topping Georgia and Texas, which netted 39 projects each. How important is that ranking? Consider this: Of the top 10 states in the Governor's Cup, eight of them placed in the top 10 in building materials, according to the Conway Data New Plant Database. Ohio won the Cup with 431 total projects, meaning that roughly 10 percent of its projects occurred in the building materials sector. Texas placed second in the Cup with 363 projects, while Georgia was fifth with 267. In both of those cases, plants that make building products accounted for more than 10 percent of their project total. The remaining top 10 states in building materials projects last year were Alabama, Florida, Virginia, Tennessee, Illinois, Pennsylvania and Michigan. Facility planners may want to take note of this trend. Where construction demand is the highest, new factories that make building products are rising from the ground. Nowhere are building materials plants sprouting up faster than Ohio. From Wooster to Milford, companies that make everything from doors and windows to steel frames are finding the Buckeye State hospitable to their projects. Wayne County, host to a cluster of titanium and other metal- working industries, brought home one of Northeast Ohio's largest building products plants last year in the form of Stonecraft Industries. When the maker of stone veneer outgrew its capacity for production in the town of Apple Creek, Stonecraft found the location it needed to expand in the nearby town of Wooster. Stonecraft – which also operates plants in Georgia, Pennsylvania, Colorado, California, Washington and Mexico – began moving into its new 300,000- sq.- ft. (27,870- sq.- m.) plant in Wooster in December. The $24- million project creates 300 jobs. "The need to expand was driven from a strategic standpoint," says Glenn Thomson, general manager of Stonecraft. "The company wanted to create a brand that would be more price- competitive in the marketplace, produce more volume and be located at a single facility. We were looking in Wayne County to stay with the same, local work force." Wooster, the No. 2 micropolitan area in the U.S. last year for new and expanded facilities (see story on p. 209), and the Wayne Economic Development Council (WEDC) worked closely with Stonecraft to identify and permit a site for development. "We found a site located close to Route 30 and Route 250 and with good access to Interstates 71 and 77," says Thomson. "The Wayne County work force is pretty stable and dependable. We are outside of the Cleveland metroplex, so there are not as many of the bigger companies here. We don't have to compete as much for labor. This is a very family- oriented town." Stonecraft received tax abatement incentives from the state of Ohio, the county and the town of Wooster. "The county was very helpful, and the WEDC and city of Wooster were quite helpful in expediting things," Thomson adds. Thomson also cites the area's low cost of doing business, affordable property taxes, good transportation network and "relatively good source of raw materials here in this market – aggregates, cement and a series of oxides for color." Rod Crider, president of the WEDC, says his organization helped Stonecraft by matching it with local developer Jerry Baker, who put together a deal on a piece of property he owned in Wooster. "It worked out extremely well," Crider says. While there is a strong correlation between the presence of building materials plants and overall corporate project activity in the U.S., the evidence internationally is just as compelling. India, Russia, Vietnam, Mexico and China led all non- U.S. locations in building materials facilities last year. Other top locations included the United Kingdom, the United Arab Emirates, Latvia, Japan, Malaysia, Hungary, Bulgaria and Saudi Arabia. Peter Linneman, chief economist for NAI Global and principal of Linneman Associates at the Wharton School of Business, recently authored a report stating that China is the key variable in influencing global supply and demand for building materials. "Construction projects are becoming prohibitively expensive around the world. Why? Because the global demand for concrete, steel, wood and other key construction materials has exploded due to economic and infrastructure growth in China, while supply has lagged badly," wrote Linneman. In addition to consuming 47 percent of the world's cement supply, China is now its largest producer, generating more than 1 billion tons annually. "Similarly, world commodity prices have increased dramatically over the last several years. … However, today's rising prices will revert as the net consumers of today's construction materials rapidly expand their domestic production requirements." Linneman notes that China is now the world's largest consumer of steel, accounting for one- third of global demand, as well as eating up 22 percent of global copper supplies and 20 percent of the world's aluminum. He also reports that in just seven years, China went from being the seventh largest importer of forest products to second. "China currently consumes 47 percent of the world's supply of cement, some five times the size of the entire U.S. cement industry," he noted. "Now it is the largest cement producer in the world, generating in excess of 1 billion tons of cement annually." The net effect of China's rapid expansion, Linneman predicts, is that eventually China's growing supply of building products will exceed its demand. "Over the next five to seven years, China will become a substantial net exporter of most global products," he states. "Their planned capacity will far exceed domestic demand growth, which, combined with greater consumption efficiency and the emergence of alternative technologies, will lead to a prolonged period of declining prices for commodities and construction materials." What does all of this mean for companies expanding their facilities in North America? Most industry experts estimate that construction costs will rise 6 to 8 percent in 2007 and then stabilize. Already, most building material prices have stabilized since mid- 2006. Also, industry analysts say, look for more new and expanded plants in the building materials sector throughout North America. Ohio currently leads in this category, but other states just outside the top 10 – including North Carolina, Indiana and Minnesota – are quickly gaining ground.